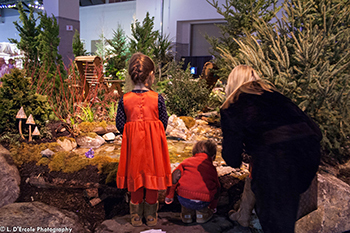 While the Rhode Island Spring Flower & Garden Show opens to the public on Thursday, February 19, it&apos;s possible to get a taste of spring a bit early and support an important cause. Get a sneak peek of the beautiful buds at the Flower Show Preview Party on February 18 from 6 p.m. to 8 p.m. at the RI Convention Center. All proceeds from the event will benefit the Gloria Gemma Breast Cancer Resource Foundation. This intimate reception features delicious samplings of restaurants, breweries and wineries from approximately 15 vendors. Be among the first to enjoy the spectacular Flower Show displays in full bloom. The Gloria Gemma Foundation provides support to families and patients touched by breast cancer and provides breast health and wellness education in the Greater Rhode Island area. The Foundation supports the people and families with breast cancer with love, information and resources. Tickets for this exclusive preview are $65 per person. To purchase tickets contact the Gloria Gemma Foundation at 401-861-HERO (4376) or visit gloriagemma.org. Laura is a junior at Johnson & Wales University, studying Sport, Entertainment, and Event Management. Her interests include reading, writing, the art of tattooing, and watching documentaries about the world's cultures and ways of life. She hopes to one day travel to Sri Lanka and Italy.